Indeed, it was Blek’s silhouette stencil of a rat (an image Banksy was later to adopt for Bristol and London) as early as 1981 that broke away from the graffiti political slogans and injected it with a fresh new language of political art. Blek has always used his art as both a democratic means of bringing the gallery walls to the people and to change the way we interact with the urban spaces around us. This is essentially the blueprint street artists the world over are still reading from today. 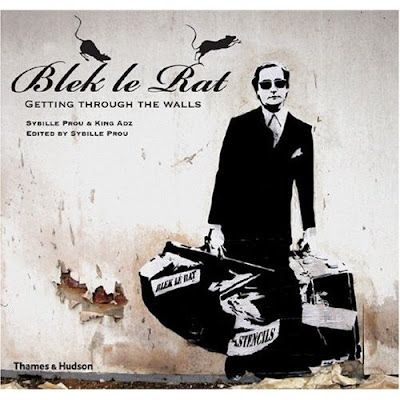 In recognition of this Thames & Hudson have published a beautifully produced retrospective book entitled, Blek Le Rat: Getting Through the Walls. To celebrate the book launch the Black Rat Gallery is staging the largest Blek exhibition to date. The show will feature many new works as well as iconic images tracing the history of Blek’s career, along with a number of prints – available from the gallery on the night. The private view/ book signing is tonight the 8th May and is invite only. If you don' t have an invite for the show tonight you can always pop along to the London Graphic Centre in Covent Garden where Blek will also be signing copies of his book in-store on Thursday the 8th of May (1- 3pm).